If one takes in only Lewis’ book-length works, it is easy to maintain this opinion. However, it quickly becomes apparent that Lewis had a lot to say about politics and had some clear views about what politics ought to be about. At the same time, Lewis generally wrote at a conceptual level, though he occasionally had something say about particular political propositions. However, in these cases, he focused on the issue, with its supporting arguments, rather than the people and power structures involved. 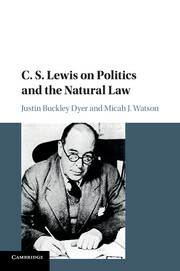 In their recent book, C. S. Lewis on Politics and the Natural Law, Justin Buckley Dyer from the University of Missouri and Micah J Watson at Calvin College have worked to offer a systematic presentation of Lewis’ writing on politics and natural law. Although Lewis wrote a great deal about politics and natural law, he did not write a single reference volume. Thus, the work that Dyer and Watson have done contributes to both political science and Lewis studies. This brief book has seven chapters. It begins by debunking the misperception that Lewis was not political in Chapter One. In the second chapter, the authors summarize the pattern of the Christian worldview–– Creation, Fall, and Redemption––which is always present and often overt in Lewis’ writing. Chapter Three puts Lewis’ work in contact with some of the significant criticisms of natural law theory, particularly the critique of Karl Barth. In the fourth chapter, Watson and Dyer focus on one of Lewis’ most important works for both ethics and political science, The Abolition of Man. In that chapter they outline some of the many changes in culture that Lewis was responding to in that short volume. Chapter Five contains the most debatable proposition of the volume, where they argue that Lewis’ held to a form of Lockean Liberalism. There is evidence to support their case, though Lewis never cites Locke; the authors remain on safe ground by arguing that Lewis and Locke shared many tenets in their political philosophy. In the sixth chapter, the authors discuss some of Lewis’ writing on political discourse and the place of Christianity in the political sphere. There is much to be learned from Lewis in this regard. The book concludes with Chapter Seven, the authors summarize their arguments and urge the reader to continue to engage contemporary issues through the work of C. S. Lewis. At times, given the amount of secondary literature on C. S. Lewis, one wonders whether there is much more to say about him. Whether academic studies of Lewis will run their course remains to be seen, but Dyer and Watson have demonstrated that there is still more to be gleaned from the voluminous work of C. S. Lewis. This book adds to the ongoing conversation about political theology, political science, and the work of C. S. Lewis. A significant danger with dual-authored volumes is uneven writing styles, which can make them difficult to read. This volume, however, has a consistent flow throughout and is a pleasure to read. C. S. Lewis on Politics and the Natural Law is a book that has potential to be a ready resource for years to come. This volume presents Lewis fairly and thoroughly and it makes it clear how Lewis can be helpful for Christians. One area that deserves further exploration is how Lewis and natural law can be helpful in building a common understanding beyond the ranks of the redeemed. The more Lewis I read, the more I find him helpful. Dyer and Watson’s book both supports that sentiment and deepens it. They have done excellent work in producing a readable volume that is both illuminating and applicable. As C. S. Lewis once wrote, “A sick society must think much about politics, as a sick man must think much about his digestion.” By this metric our society is very diseased. Even given the special focus on politics caused by it being a Presidential election year, society is excessively focused on politics because our society is a festering wound of dislike and division. One might think a book on political theology would simply contribute to the excessive focus on politics and the sickening mix of politics and religion that we are seeing with the Religious Left openly lobbying for their flawed candidates and the Religious Right arguing for theirs, too. However, in the hangover from this election, the church will do well to pick up Jonathan Leeman’s recent book, Political Church: The Local Assembly as Embassy of Christ’s Rule. This is the book on nutrition for the glutton suffering from indigestion after binging on junk food. This would be a dangerous theory if Leeman were arguing that the church has the same political purpose as a parliament or congress. There is a difference between the church and the state; they have overlapping magisteria but different means of influence. Leeman’s vision of the church and the state is not of two kingdoms, but of a single kingdom with state and church reflecting the authorities of the current kingdom and the future kingdom, respectively. Leeman stands well within the Augustinian tradition via a deep interest, though not uniformity, with Oliver O’Donovan. This is not an introductory volume on political theology. Leeman’s discussion is a distinct approach to the place of the church in contemporary politics, but understanding this volume requires a fair understanding of the various political theologies that he is critiques and is building upon. At the same time, Leeman’s volume begins a step before many others do by addressing some of the basic questions that one must understand before attempting a political theology. The first two chapters of the volume address the important questions, (1) What is politics? and (2) What is an institution? The various meanings of these terms are discussed in some depth before moving on. Though Leeman leaves some flexibility in the terms for his own use, his discussions of historic definitions provide context for the remainder of the book. The next four chapters outline a positive political theological using a biblical theology as a foundation. The chapters run along the progression of creation, fall, redemption, and restoration. The chapter on creation places God at the center of all politics. He made this world and is the just and righteous judge of all things. It is his authority that is represented through the work of both the government and the church. The nature of politics is shaped by the nature of the creator God. In dealing with the fall, Leeman goes beyond the actual original sin of the primal couple to discuss how falleness has influenced all human interactions since that time. Leeman walks through the biblical storyline to show how sin has influenced government and increased the need for its justice. The chapter on the politics of the new covenant focuses on the ongoing need for the work of the cross to be done in public. This means repentance, forgiveness, and good natured striving for the common good. Leeman is careful to distance his view from theonomy. In fact, he notes that attempts to bring about the eschatological kingdom on earth now never end well. Instead, Christians should work to apply the gospel as much as possible to earthly situations as one would expect of citizens on the new covenant kingdom. The last chapter deals with the politics of the kingdom. However, this doesn’t refer to the eschatological kingdom, but is an especial focus on the polity of the local congregation. Leeman exercises his Baptist muscles in talking about the importance of church membership, credo baptism, and right practice of the Lord’s Supper. These are elements of the church that prefigure the coming kingdom. By being faithful to justly administer its own borders, the church stands as witness to the kingdom that is to come. The church is a political body because its policies and ministry influence the world, though it begins at a very local, individual level. Leeman’s book is a helpful approach to political theology because it begins with the narrative of Scripture and asks what the text says about the church’s political engagement. By beginning with the ideas of Scripture and working out, he formulates a much more distinctively Christian political theology. In other words, political theology generally begins with a vision of what good is, which is often derived from an interpretation of Scripture. However, most political theologies then apply an extra-biblical method to achieve the desired goods. For example, the Social Gospel movement sought (or seeks) to bring about the kingdom largely through a Rawlsian approach to government that favors strong individualism and a preference for government engagement in solutions at nearly every level. This approach then creates an implicit need for the church to pursue justice by seeking greater government control and introducing more radical human freedoms. The church’s main role in this vision of political theology is as a lobbyist to influence the state’s earthly authority. A similar criticism could be levelled against movements that are more theologically conservative, as well. The point is that Leeman’s volume offers an approach that is designed to constrain the Church to her proper role in pursuing a right polity within her own area of influence. The message of the gospel as it is preached in the church should affect all of life, but the authority of the Church in the present age is somewhat limited. Leeman’s biblical theological approach to political theology helps to keep the church in her lane, and rightly focused on the gospel. Leeman’s point is that the church is an inherently political institution. When it is functioning well, it cannot help but influence the world around with the message of the gospel. If the church fails to equip people and influence communities toward justice, as it is biblically defined, it has failed in its mission. However, when the church begins to engage in politics to increase redistribution of wealth through taxation or enforce certain moral codes through judicial means, then the church has exceeded its authority. Between these failures is the proper political role of the church. This is a helpful resource for those who are familiar with the general content of political theology. Leeman’s approach is innovative and fresh. It is distinctly biblical. As such, it is a useful resource for those seeking to live rightly in our fallen world.